If you like getting past the password screen on your computer without entering the password, then there is a way for you. 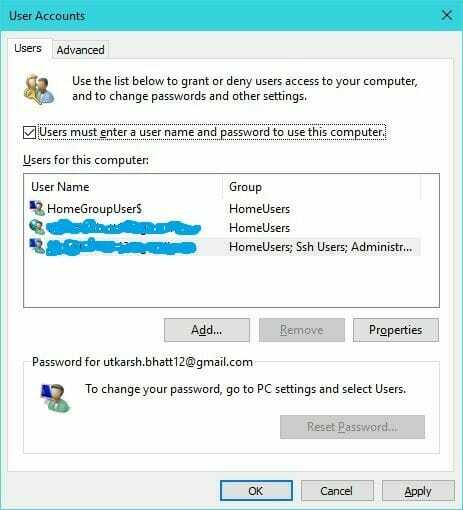 Initially, when setting up Windows, we get an option choose a password for our account. The setup screen allows us to set passwords for, both the local and online account. Unfortunately, though, Settings app and the Control Panel, both don’t have any setting to disable the password for the users. I personally, never feel like having a password on my PC. The reason for that is because I don’t like entering the password on my computer repeatedly. I know that that’s unsafe. But, the computer I use isn’t touched by anyone else in my home, so the need of a password is nullified. Continue reading below for the steps on disabling the password on Windows 10. Type netplwiz and press enter. This command will open the User Accounts settings box on your screen. Uncheck the User much enter a username and password to use this computer check box. Click OK. Close everything and restart your PC. After doing this, Windows will not ask you to enter the password for logging into your PC. This is because unless someone breaks into your house, which is a bigger issue than in on itself, there is no way that someone would access your PC without your permission. For laptops, however, this becomes a big problematic. Leaving it at someone’s place, or anywhere else where you don’t have it in your sight can compromise the data. So, be careful with this.